Roller derby is played on roller skates on a flat-track. A derby game or “bout” is composed two 30 minutes halves that are broken down into multiple shifts called jams. Each jam can last up to two minutes. For every jam, each team sends out 4 blockers (the defensive players) and 1 jammer (the point scorer). The jammer is distinguished by the star on their helmet. 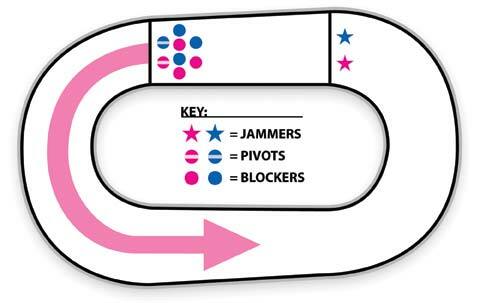 The 8 blockers must remain in proximity to each other and form the pack— every time the jammer passes through the pack, they score a point for every opposing skater they pass. 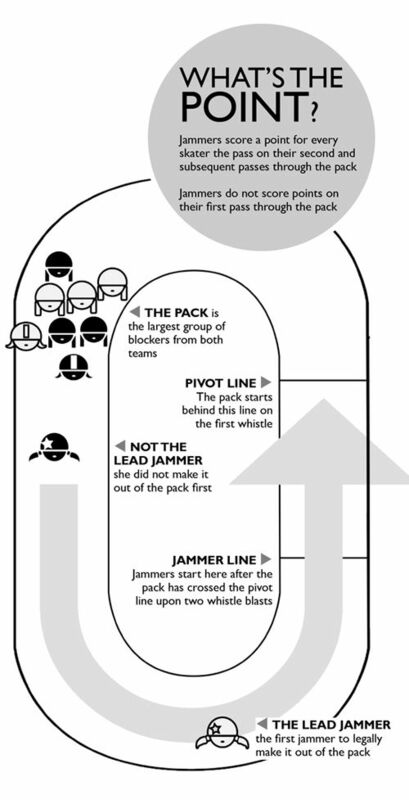 Jammers do not score points on the first pass but can earn the designation of lead jammer if they are the first skater out of the pack which allows them to stop or call off the jam prior to the end of the two minutes. At the start of the jam, blockers line up between the pivot line and jammer line (left and right lines, respectively) and jammers line up behind the jammer line. A jam start is indicated by a single whistle, the end of the jam is ended by 4 whistles. If skaters commit penalties during play, they must serve by going to the penalty box and sitting for 30 seconds per penalty. The rules of roller derby are complex and detailed. We follow the rules of the Women’s Flat Track Derby Association (WFTDA), which is the standard for the majority of roller derby play in the world. For junior play, there are some modifications, specified by Junior Roller Derby Association (JRDA). Feel free to ask questions. Our coaches and referees love to talk derby! You can also visit our FAQ page. Derby names are often seen by participants as an expression of the growth and positive transformation many of us feel as a result of our involvement in roller derby. It is not required that one choose a derby name, but it can be a lot of fun. Many names are meant to convey a kind of ferocity that is almost always tongue-in-cheek (such as one of our own, Rainbow Assassin), but others are nods to pop culture (e.g. our own Hermione Danger) or some other interest of the skater themselves (e.g. our own Oh Burrito).